A wealth of evidence supports anti-VEGF therapy in DME. 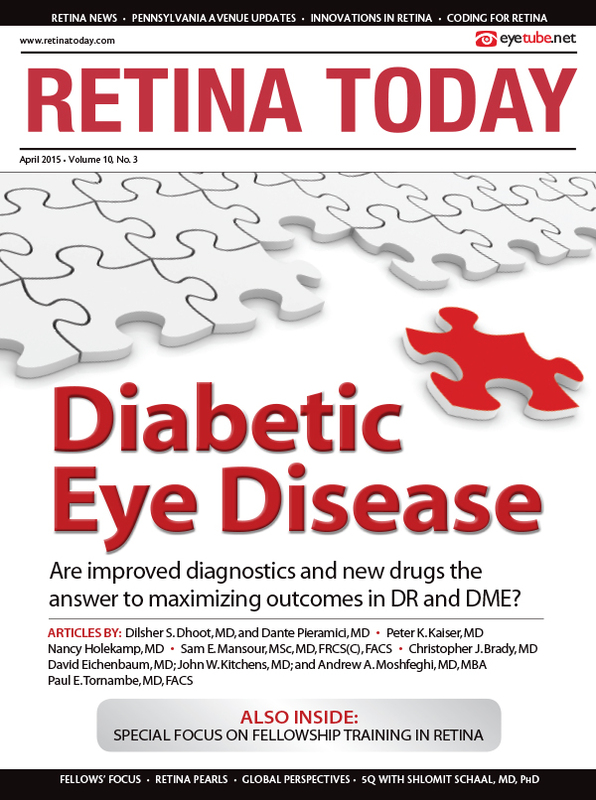 The landscape for the treatment of diabetic macular edema (DME) is evolving. Over the past 24 months alone, the US Food and Drug Administration (FDA) granted approval for three new medications for treatment of DME: the intravitreal dexamethasone implant (Ozurdex, Allergan), the fluocinolone acetonide implant 0.19 mg (Iluvien, Alimera Sciences), and aflibercept (Eylea, Regeneron) for intravitreal injection. Retina specialists have welcomed these additional agents as weapons in their toolkit for a commonly occurring, potentially vision-threatening condition that is challenging to treat. For most physicians, anti-VEGF agents have become the first-line choice for center-involved DME. A plethora of clinical trial data help support the use of these agents, including the recently released results of the DRCR.net Protocol T study,1 which provides additional guidance on the selection of an appropriate first-line agent for particular patients. In addition, recent information suggests that acute and chronic inflammatory changes occur in the retina and choroid. Interactions between vascular damage and inflammation further accelerate retinal injury, leading to advanced stages of DR and blindness.8 The multimechanism pathophysiologies of DR and DME suggest a role for combination therapies. For many years, focal laser photocoagulation was the standard of care for the treatment of DME. The results of the landmark Early Treatment Diabetic Retinopathy Study (ETDRS) demonstrated a 50% reduction in moderate vision loss (> 3 lines) with laser compared with observation. Significant visual gains were not seen with laser photocoagulation,9 however, resulting in a continued need for better and more effective therapies. To date, four intravitreal anti-VEGF agents have been tested in prospective randomized clinical trials for the treatment of DME: pegaptanib (Macugen, Valeant), bevacizumab (Avastin, Genentech), ranibizumab (Lucentis, Genentech), and aflibercept. Both ranibizumab and aflibercept are FDA-approved for the treatment of DME. Bevacizumab is used off-label by a large number of retina specialists (54% of US retina specialists responding to a survey reported using bevacizumab as first-line therapy for phakic patients with 20/50 vision12). Pegaptanib is used to a much lesser extent for DME. Derived from the same murine antibody as bevacizumab, ranibizumab is a monoclonal antibody fragment.21 Data from the DRCR.net Protocol I study, RESTORE, and RISE and RIDE trials demonstrated the efficacy of ranibizumab against DME. In our view, these study results leave no doubt about the efficacy of ranibizumab in treatment of DME.10,22-26 All of these studies had a duration of 36 months; the greatest benefit in visual acuity gain was seen in the first year of each study, with more modest changes thereafter. In Protocol I, ranibizumab 0.5 mg was administered for four loading doses and then given on an as-needed (PRN) basis, with evaluations every 4 weeks thereafter. Patients received either prompt or deferred laser as an adjunct treatment. At 12 months, patients receiving ranibizumab plus deferred laser had a 9-letter improvement in visual acuity compared with a gain of 3 letters in the sham plus prompt laser group.23 Results were similar in the ranibizumab plus prompt laser group. Comparing trials using PRN (RESTORE and Protocol I) and those using monthly treatment regimens, it appears at first glance that there were stark differences in visual outcomes. However, the differences likely reflect a “ceiling effect.” Because the PRN trials on average included patients with higher levels of baseline visual acuity, patients had less opportunity for gain (ie, the ceiling effect). Overall, the PRN trials reassured us that monthly treatment was not necessary to enjoy visual benefits from anti-VEGF treatment. Retina specialists are fortunate to have three anti-VEGF agents that have demonstrated efficacy based on well-controlled randomized trials. However, these agents are not structurally or pharmacologically identical. Surely, the greatest publicized and perceived difference in these agents has been cost. Allowable charges for Medicare vary from approximately $67 for 1.25 mg bevacizumab, to $1189 for 0.3 mg ranibizumab, to $1961 for 2.0 mg aflibercept. Payers and legislators have questioned whether the added cost for the latter two agents can be justified by demonstrable visual acuity or anatomic gains. Protocol T, much like its counterpart CATT in patients with age-related macular degeneration,29 set out to investigate potential efficacy and safety differences among anti-VEGF agents in the treatment of central DME. The DRCR.net Protocol T trial was conducted at 89 clinical sites in the United States. In total, 660 adults with center-involved DME were randomized to 0.05 mL of 1.25 mg bevacizumab, 0.3 mg ranibizumab, or 2.0 mg aflibercept. The primary endpoint was change in visual acuity at 1 year, with planned follow-up through 24 months. Patients did not have to be naïve to treatment but could not have received anti-VEGF therapy within the previous year. A computer-assisted treatment algorithm was used to guide therapy. The algorithm was a modified PRN therapy based on visual acuity and optical coherence tomography (OCT) findings. All three anti-VEGF agents produced visual acuity gains at 12 months. For all patients, improvement was greatest with aflibercept (13 letters) versus ranibizumab (11 letters) or bevacizumab (10 letters). The 2 to 3 letter benefit seen with aflibercept over both ranibizumab and bevacizumab was statistically significant, although the primary driver for this difference was baseline visual acuity. A prespecified data analysis divided patients into those with baseline visual acuity of 20/40 or better versus those with 20/50 or worse (Table). For patients with baseline visual acuity of 20/40 or better, no significant difference was seen among all three drugs: gains of 7.5 letters with bevacizumab, 8.3 letters with ranibizumab, and 8.0 letters with aflibercept. For patients with 20/50 or worse visual acuity, aflibercept had a larger advantage, with gains of 18.9 letters for aflibercept, 14.2 letters for ranibizumab, and 11.8 letters for bevacizumab (P < .001 for aflibercept vs bevacizumab, P = .003 for aflibercept vs ranibizumab, and P = .21 for ranibizumab vs bevacizumab). Moreover, the superiority of aflibercept in patients with worse baseline visual acuity translated into a clinically useful advantage, with significantly more patients achieving gains of greater than 3 lines (67% with aflibercept, 50% with ranibizumab, and 41% with bevacizumab). A similar effect to visual outcomes was seen with baseline OCT central thickness: the worse the disease (baseline OCT > 400 µm), the greater the benefit for patients treated with aflibercept. The anatomic benefit at 1 year (reduction in central retinal thickness) was numerically superior for aflibercept over ranibizumab, but the difference was not statistically significant. However, both aflibercept and ranibizumab reduced central retinal thickness to a greater extent than bevacizumab regardless of baseline vision. These differences were statistically significant. The relative benefit of aflibercept was not driven by more injections or other treatments. In fact, the median number of injections was one fewer in the aflibercept group (9) than in the ranibizumab or bevacizumab groups (10; P = .045 for overall comparison). Laser was also performed less often with aflibercept (37% of patients) than with ranibizumab (46%) or bevacizumab (56%; P < .001 for overall comparison). The intraocular and systemic safety of intravitreal anti-VEGF agents has been well documented. Protocol T did not reveal any increased rates of intraocular inflammation or endophthalmitis among the treatment groups or in comparison with previous trials. Moreover, systemic adverse events, deaths, hospitalizations, and major cardiovascular events were similar in the three treatment groups and consistent with earlier studies. A post hoc analysis did find a small but significant increase in reported cardiac and/or vascular events in the ranibizumab group. The authors concluded that, given the inconsistency of this result with prior trials, this finding may have been a chance event. Overall, given the relatively small number of patients in this study, no definitive conclusions can be drawn about potentially rare safety differences among the drugs. The results of Protocol T have been long awaited and are a welcome addition to the body of literature that supports the use of all three anti-VEGF agents in the treatment of center-involved DME. Aflibercept’s superior performance in patients with 20/50 or worse visual acuity is notable. In considering the applicability of this study to our day-to-day practice, one must factor in that these results reflect population outcome averages with much underlying individual variability. Dilsher S. Dhoot, MD, and Dante Pieramici, MD, are members of California Retina Consultants and Research Foundation, Santa Barbara, California. Dr. Dhoot may be reached at ddhoot@yahoo.com; Dr. Pieramici may be reached at dpieramici@yahoo.com. 2. Ding J, Wong TY. Current epidemiology of diabetic retinopathy and diabetic macular edema. Curr Diab Rep. 2012;12(4):346-354. 3. Aiello LP, Avery RL, Arrigg PG, et al. Vascular endothelial growth factor in ocular fluid of patients with diabetic retinopathy and other retinal disorders. New Engl J Med. 1994;331(22):1480-1487. 4. Avery RL. Regression of retinal and iris neovascularization after intravitreal bevacizumab (Avastin) treatment. Retina. 2006;26(3):352-354. 5. Nguyen QD, Tatlipinar S, Shah SM, et al. Vascular endothelial growth factor is a critical stimulus for diabetic macular edema. Am J Ophthalmol. 2006;142(6):961-969. 6. Antcliff RJ, Marshall J. The pathogenesis of edema in diabetic maculopathy. Semin Ophthalmol. 1999;14(4):223-232. 7. Ciulla TA, Amador AG, Zinman B. Diabetic retinopathy and diabetic macular edema: pathophysiology, screening, and novel therapies. Diabetes Care. 2003;26(9):2653-2664. 8. Noma H, Mimura T, Yasuda K, Shimura M. Role of inflammation in diabetic macular edema. Ophthalmologica. 2014;232(3):127-135. 9. Photocoagulation for diabetic macular edema. Early Treatment Diabetic Retinopathy Study report number 1. Early Treatment Diabetic Retinopathy Study research group. Arch Ophthalmol. 1985;103(12):1796-1806. 10. Nguyen QD, Brown DM, Marcus DM, et al. Ranibizumab for diabetic macular edema: results from 2 phase III randomized trials: RISE and RIDE. Ophthalmology. 2012;119(4):789-801. 11. Ip MS, Domalpally A, Hopkins JJ, et al. Long-term effects of ranibizumab on diabetic retinopathy severity and progression. Arch Ophthalmol. 2012;130(9):1145-1152. 12. Stone TW. Preferences and Trends Membership Survey. Presented at: the Annual Meeting of the American Society of Retina Specialists; August 9-13, 2014; San Diego, CA. 13. Ferrara N. Vascular endothelial growth factor: basic science and clinical progress. Endocr Rev. 2004;25(4):581-611. 14. Soheilian M, Ramezani A, Bijanzadeh B, et al. Intravitreal bevacizumab (Avastin) injection alone or combined with triamcinolone versus macular photocoagulation as primary treatment of diabetic macular edema. Retina. 2007;27(9):1187-1195. 15. Soheilian M, Ramezani A, Obudi A, et al. Randomized trial of intravitreal bevacizumab alone or combined with triamcinolone versus macular photocoagulation in diabetic macular edema. Ophthalmology. 2009;116(6):1142-1150. 16. Solaiman KA, Diab MM, Abo-Elenin M. Intravitreal bevacizumab and/or macular photocoagulation as a primary treatment for diffuse diabetic macular edema. Retina. 2010;30(10):1638-1645. 17. Scott IU, Edwards AR, Beck RW, et al. Diabetic Retinopathy Clinical Research Network. A phase II randomized clinical trial of intravitreal bevacizumab for diabetic macular edema. Ophthalmology. 2007;114(10):1860-1867. 18. Rajendram R, Fraser-Bell S, Kaines A, et al. A 2-year prospective randomized controlled trial of intravitreal bevacizumab or laser therapy (BOLT) in the management of diabetic macular edema: 24-month data: report 3. Arch Ophthalmol. 2012;130(8):972-979. 19. Michaelides M, Kaines A, Hamilton RD, et al. A prospective randomized trial of intravitreal bevacizumab or laser therapy in the management of diabetic macular edema (BOLT study): 12-month data: report 2. Ophthalmology. 2010;117(6):1078-1086.e1072. 20. Arevalo JF, Sanchez JG, Wu L, et al. Primary intravitreal bevacizumab for diffuse diabetic macular edema: the Pan-American Collaborative Retina Study Group at 24 months. Ophthalmology. 2009;116(8):1488-1497, 1497 e1481. 21. Chen Y, Wiesmann C, Fuh G, et al. Selection and analysis of an optimized anti-VEGF antibody: crystal structure of an affinity-matured Fab in complex with antigen. J Mol Biol. 1999;293(4):865-881. 22. Mitchell P, Bandello F, Schmidt-Erfurth U, et al. The RESTORE study: ranibizumab monotherapy or combined with laser versus laser monotherapy for diabetic macular edema. Ophthalmology. 2011;118(4):615-625. 23. Elman MJ, Aiello LP, Beck RW, et al; Diabetic Retinopathy Clinical Research Network. Randomized trial evaluating ranibizumab plus prompt or deferred laser or triamcinolone plus prompt laser for diabetic macular edema. Ophthalmology. 2010;117(6):1064-1077 e1035. 24. Elman MJ, Bressler NM, Qin H, et al. Expanded 2-year follow-up of ranibizumab plus prompt or deferred laser or triamcinolone plus prompt laser for diabetic macular edema. Ophthalmology. 2011;118(4):609-614. 25. Elman MJ, Qin H, Aiello LP, et al; Diabetic Retinopathy Clinical Research Network. Intravitreal ranibizumab for diabetic macular edema with prompt versus deferred laser treatment: three-year randomized trial results. Ophthalmology. 2012;119(11):2312-2318. 26. Brown DM, Nguyen QD, Marcus DM, et al. Long-term outcomes of ranibizumab therapy for diabetic macular edema: the 36-month results from two phase III trials: RISE and RIDE. Ophthalmology. 2013;120(10):2013-2022. 27. Elman MJ, Ayala A, Bressler NM, et al; Diabetic Retinopathy Clinical Research Network. Intravitreal ranibizumab for diabetic macular edema with prompt versus deferred laser treatment: 5-year randomized trial results. Ophthalmology. 2015;122(2):375-381. 28. Korobelnik JF, Do DV, Schmidt-Erfurth U, et al. Intravitreal aflibercept for diabetic macular edema. Ophthalmology. 2014;121(11):2247-2254. 29. Group CR, Martin DF, Maguire MG, et al. Ranibizumab and bevacizumab for neovascular age-related macular degeneration. New Engl J Med. 2011;364(20):1897-1908. 30. Dhoot DS, Pieramici DJ, Nasir M, et al. Residual edema evaluation with ranibizumab 0.5 mg and 2.0 mg formulations for diabetic macular edema (REEF study) [Published online ahead of print January 30, 2015]. Eye. doi: 10.1038/eye.2014.338.